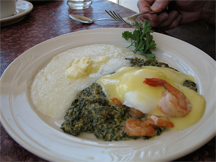 Eggs Sardou at Lucile's: poached eggs, creamed spinach, gulf shrimp, grits. Right about now (late 2010), supplies of two of the products pictured here are threatened by two different incidents that affect their respective supply chains. Eggs have been recalled because of salmonella contamination (see the U.S. Food and Drug Administration's Web site), and the BP oil disaster in the Gulf of Mexico has interrupted supplies of gulf shrimp (see the U.S. National Oceanic and Atmospheric Administration's Web site). The two incidents are probably traceable, respectively, to relaxation of Federal regulatory activity in egg production and oil production. If indeed deregulation is responsible, it could be interpreted as a form of management debt on a societal scale. That is, the decision to achieve lower cost production by deregulation might have been a decision that incurred management debt, and the "interest charges" might then have been occasional supply interruptions caused by elevated recall rates or elevated incidence of catastrophic production accidents. To some extent, these consequences of deregulation are predictable, because deregulation shifts responsibility for safe operations from more impartial federal inspectors to producers, who have clear conflicts of interest. Photo (cc) squidish (Susan Michael). The concept of management debt, like technical debt, is useful for forecasting the costs of consequences of decisions. Projections of recurring charges resulting from decisions can help discriminate among alternatives. Here are four tips for those who want to project the costs of management debt. Even when we understand a decision's long-term costs, projections depend on market conditions, technological evolution, the legal environment, and many other factors. Quantitative projections can face criticism of their most basic assumptions. Still, there's an irony in these criticisms. We have little difficulty accepting three-year and five-year projections for projects we adore, or for the enterprise itself. The same assumptions used for those projections can serve for projecting the costs of management debt. True, some additional estimates might be needed, but they're usually no more difficult to construct than are the estimates we're already making. What makes the interest on management debt so much more difficult to project is very simple: it's distasteful. Whenever we quantify the consequences of a distasteful decision, and the projections we make are debatable, politics enters the conversation. The likelihood and intensity of the politics increases with the importance of the resources under debate. Political activity in itself is not unhealthy, but long-lived, intense political debate can become toxic. A pattern of political activity surrounding issues of management debt can make effective internal resolution so improbable that the debate can remain unresolved long enough to threaten organizational survival. When this happens, seek credible impartial opinions outside the organization. it's distastefulrecurring costs of management debt prevent the organization from exploiting revenue opportunities, we must charge those lost opportunities to the cost of carrying management debt. And since revenue far exceeds the costs of generating it, the most significant costs of management debt are often lost revenue. Yet, we rarely include lost revenue opportunities in the cost of decisions, especially decisions not to do something. Lost revenues seem so debatable, so flimsy, and so speculative. To break this habit, focus not only on unexploited opportunities for new revenue, but also on declining market share and lost customers. An often-neglected source of interest on management debt is the cost of doing nothing. For instance, if we must terminate people who've stagnated because we failed to keep our technology current, the costs of those terminations, and the consequent loss of organizational knowledge, trace directly to the decision to continue using outdated technology. Accurate accounting for stagnation requires not only recognition of the recurring charges for the management debt, but also accrual of the cost of ultimately dealing with the stagnation. Would you like to see your comments posted here? rbrenNPKfkiAnuizutMpGner@ChacagmnXfImEOaMeMzGoCanyon.comSend me your comments by email, or by Web form. Ever had one of those forehead-slapping moments when someone explained something, or you suddenly realized something? They usually involve some idea or insight that would have saved you much pain, trouble, and heartache, if only you had known. I offer email and telephone coaching at both corporate and individual rates. Contact Rick for details at rbrenFCbjkUFiCkfZhudlner@ChacptkXKsRXPWnuZSRaoCanyon.com or (650) 787-6475, or toll-free in the continental US at (866) 378-5470.